1. 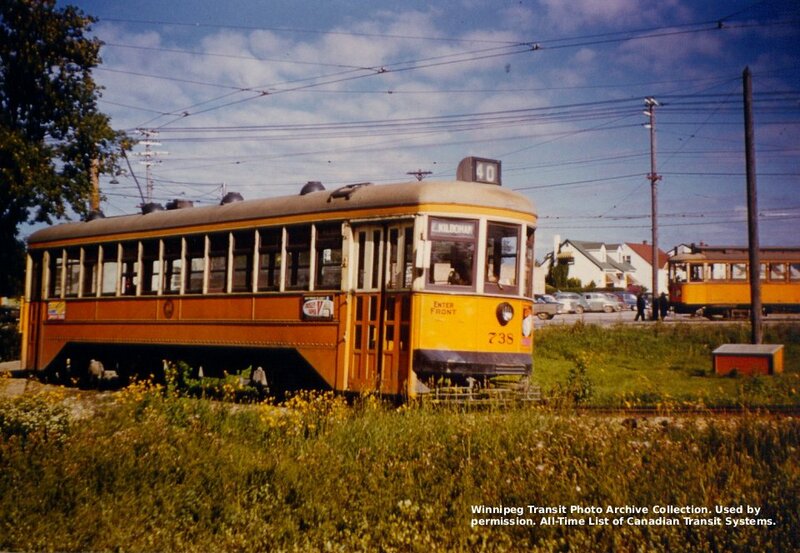 (above) Winnipeg Electric Company streetcar 408. 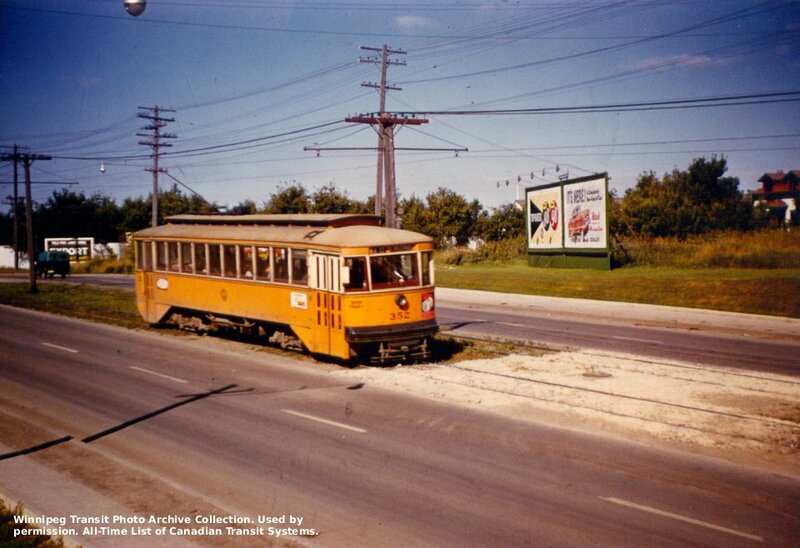 Location: Southbound Kelvin Street (later renamed Henderson Highway) at Hespeler Avenue in Winnipeg. The flag in the background flys from the Elmwood Post Office. Date: prior to Greater Winnipeg Transit Commission takeover 30 May 1953. Credit: Winnipeg Transit Photo Archive Collection. 2. 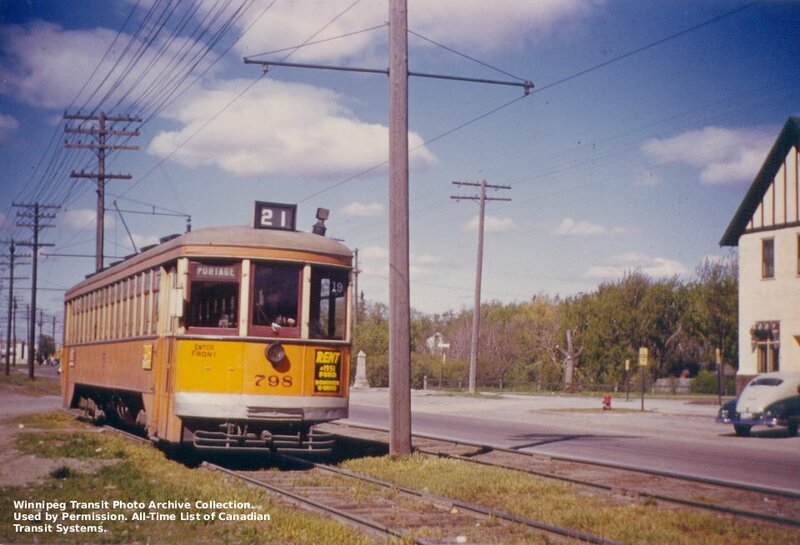 (above) Winnipeg Electric Company streetcar 798. Location: Southbound Main Street at Rupertsland, passing the Green Brier Inn in West Kildonan. The monument to the Seven Oaks Massacre can be seen across the street from the photographer, just about to be eclipsed by the streetcar. Date: prior to Greater Winnipeg Transit Commission takeover 30 May 1953. Credit: Winnipeg Transit Photo Archive Collection. 3. 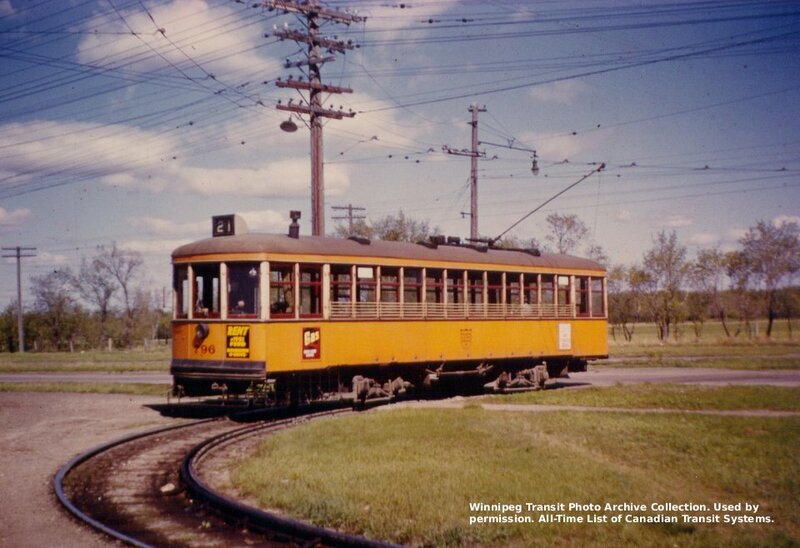 (above) Winnipeg Electric Company streetcar. Location: northbound on Main Street at Broadway, in front of Union Station, Winnipeg. Date: prior to Greater Winnipeg Transit Commission takeover 30 May 1953. Credit: Winnipeg Transit Photo Archive Collection. 4. 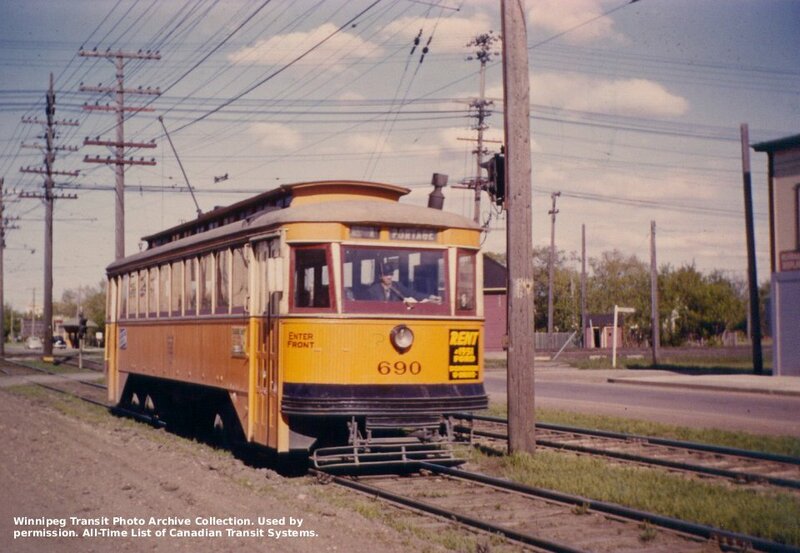 (above) Winnipeg Electric Company streetcar 690. Location: unidentified, destination "Portage" probably implies either southbound on Main street or westbound on Portage Avenue. Most likely location is westbound on Portage Avenue at Madison. Date: prior to Greater Winnipeg Transit Commission takeover 30 May 1953. Credit: Winnipeg Transit Photo Archive Collection. 5. 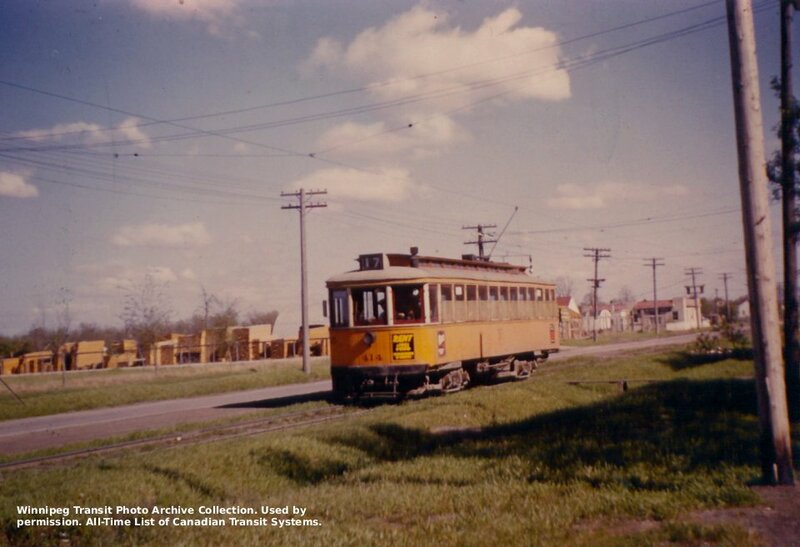 (above) Winnipeg Electric Company streetcar 414. Location: Northbound on Ste. Anne's Road at Fermor Avenue in St. Vital. Claydon Company, general contractors and building supply, can be seen across the road. Date: Destination "17" (Portage Avenue at Polo Park loop) was used for inbound Ste. Anne's cars between 26 November 1950 and 01 July 1952. Credit: Winnipeg Transit Photo Archive Collection. 6. 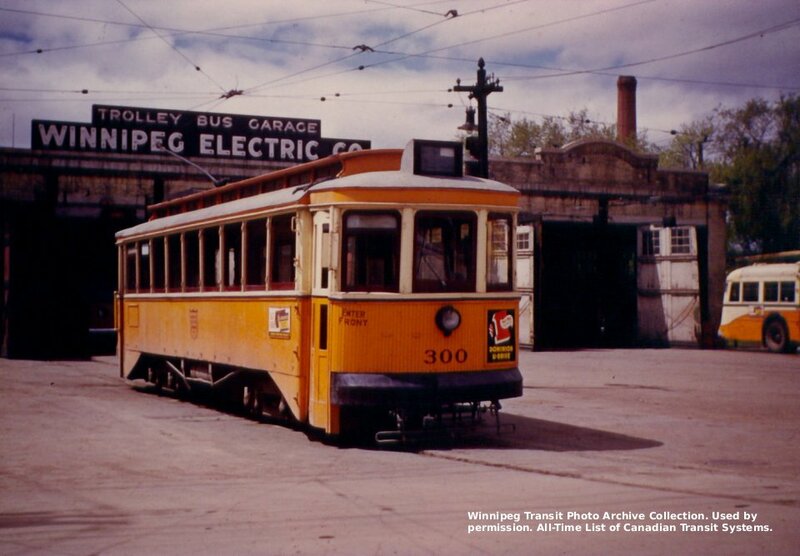 (above) Winnipeg Electric Company streetcar 300. 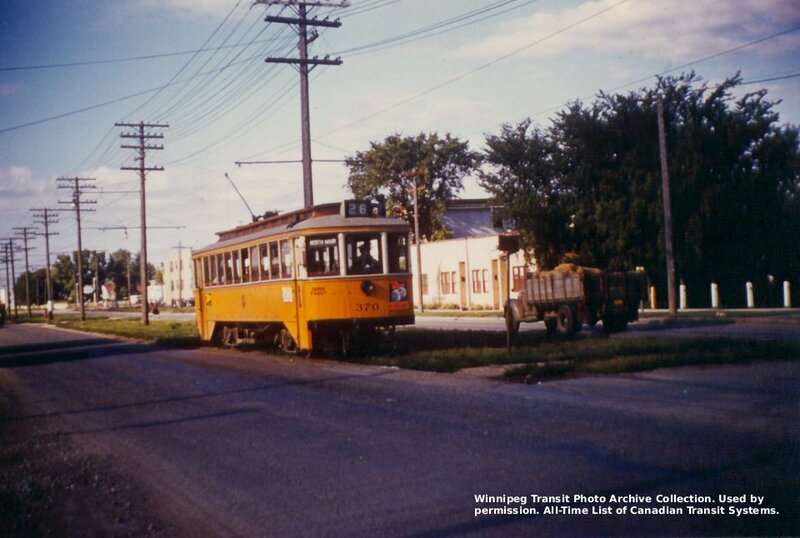 Location: apron of Main Street carhouse (trolley bus garage) at Main Street and Assiniboine Avenue, Winnipeg. Date: prior to formation of Greater Winnipeg Transit Commission 30 May 1953. Credit: Winnipeg Transit Photo Archive Collection. Note: This photograph appears in colour on the endpapers of John Baker's book Winnipeg's Electric Transit (Railfare Enterprises, 1982). John dated the photo to May 1951, and credited William E. Robertson. 7. 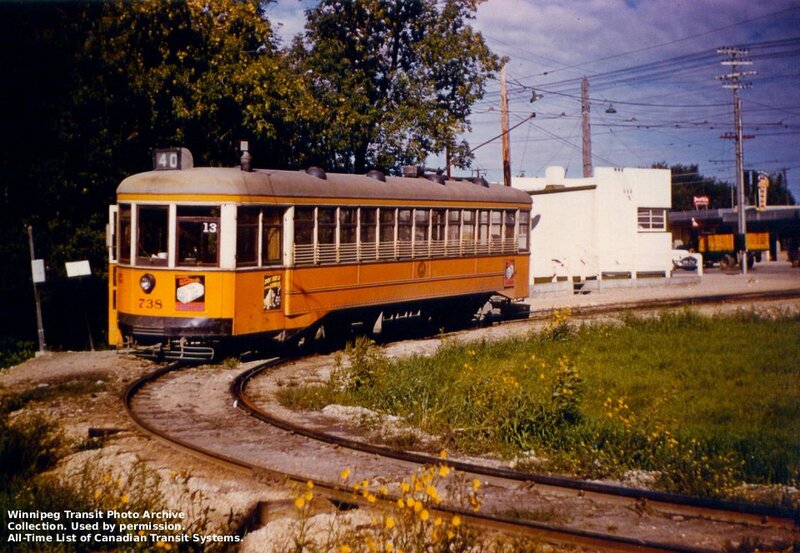 (above) Winnipeg Electric Company streetcar 360. Location: westbound on Redwood Avenue, just off the Redwood Bridge over the Red River, Winnipeg. Date: prior to formation of Greater Winnipeg Transit Commission 30 May 1953. Credit: Winnipeg Transit Photo Archive Collection. 8. 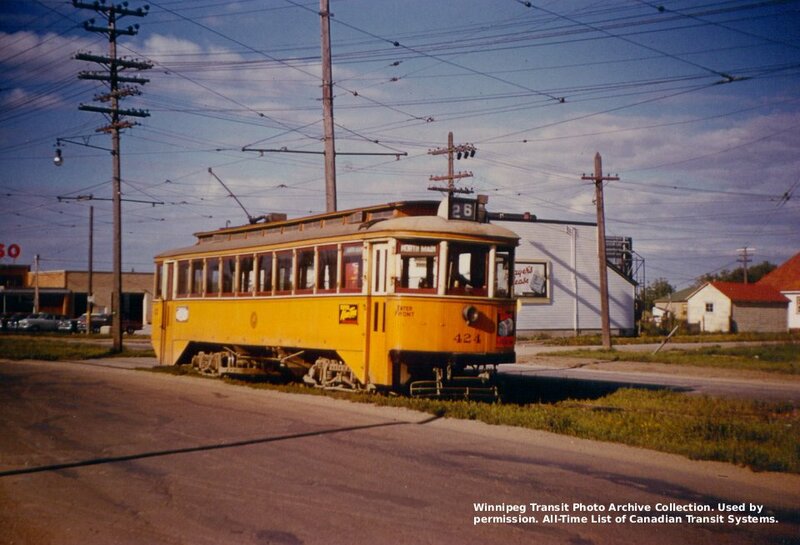 (above) Winnipeg Electric Company streetcar 796. Location: north end of Main Street route at Margaret loop in West Kildonan. The greenspace across the street behind the car is Kildonan Park. Date: prior to formation of Greater Winnipeg Transit Commission 30 May 1953. Credit: Winnipeg Transit Photo Archive Collection. 9. 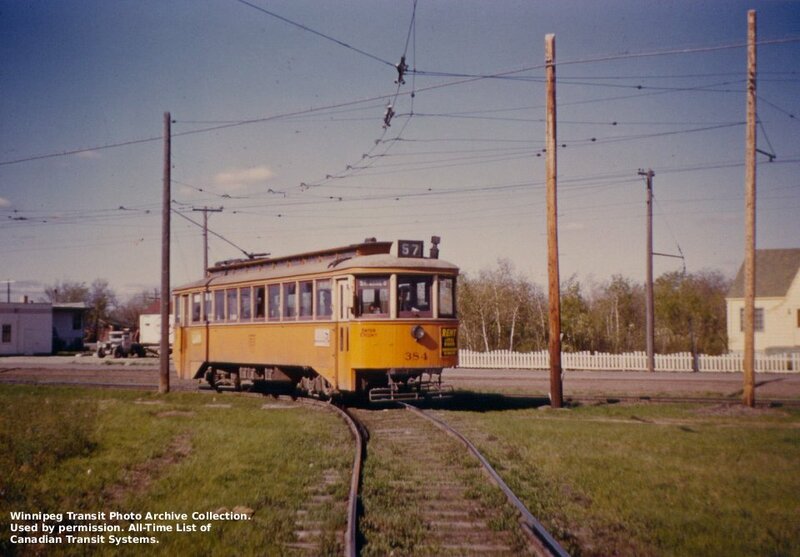 (above) Winnipeg Electric Company streetcar 384. Location: Hindley loop in St. Vital, at the south end of St. Anne's route. Date: prior to closure of the Ste. 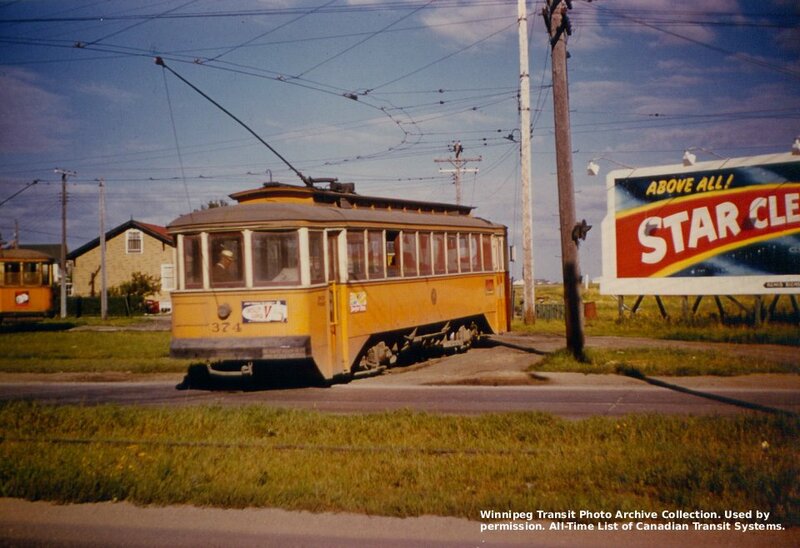 Anne's streetcar route 01 July 1952. Credit: Winnipeg Transit Photo Archive Collection. 10. 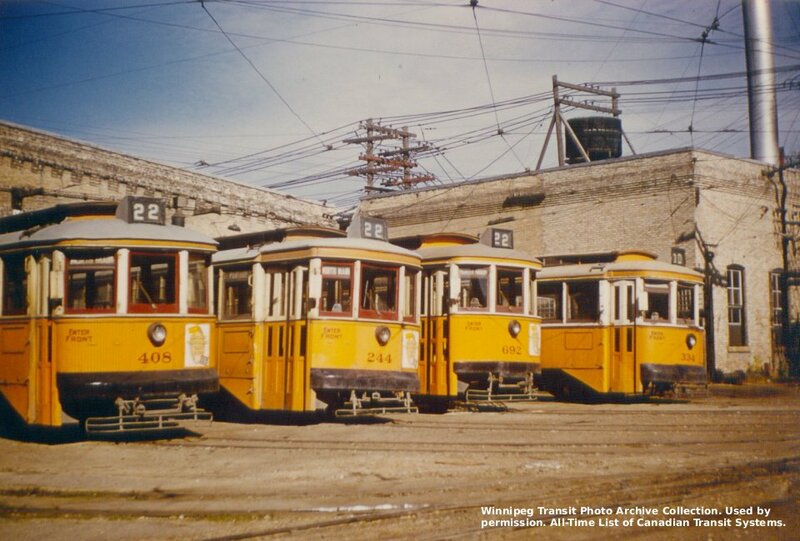 (above) Winnipeg Electric Company streetcars. Location: probably North Field on Main Street, Winnipeg. (Possibly Fort Rouge yard on Osborne Street). Date: prior to Greater Winnipeg Transit Commission takeover 30 May 1953. Credit: Winnipeg Transit Photo Archive Collection. 11. (above) Greater Winnipeg Transit Commission streetcars 408, 244, 692, and 334. Location: unidentified, probably North Main carbarn at Main Street and Luxton Avenue in Winnipeg. Date: after formation of Greater Winnipeg Transit Commission 30 May 1953. Credit: Winnipeg Transit Photo Archive Collection. 12. 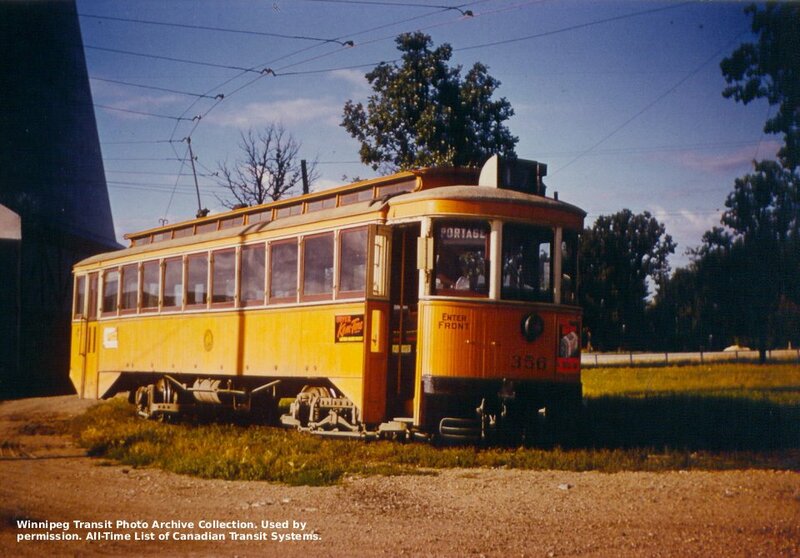 (above) Greater Winnipeg Transit Commission streetcar 408. Location: unidentified, probably North Main carbarn at Main Street and Luxton Avenue in Winnipeg. Date: after formation of Greater Winnipeg Transit Commission 30 May 1953. Credit: Winnipeg Transit Photo Archive Collection. 13. (above) Greater Winnipeg Transit Commission streetcar 370. Location: northbound on Main Street between Jefferson and Hartford. Date: after formation of Greater Winnipeg Transit Commission 30 May 1953. Credit: Winnipeg Transit Photo Archive Collection. 14. (above) Greater Winnipeg Transit Commission streetcar 370. Location: northbound on Main street at Kildonan Park (McKay Drive) Some of the gateposts of Shaarey Zedek Cemetery are visible beyond the car. Date: after formation of Greater Winnipeg Transit Commission 30 May 1953. Credit: Winnipeg Transit Photo Archive Collection. 15. 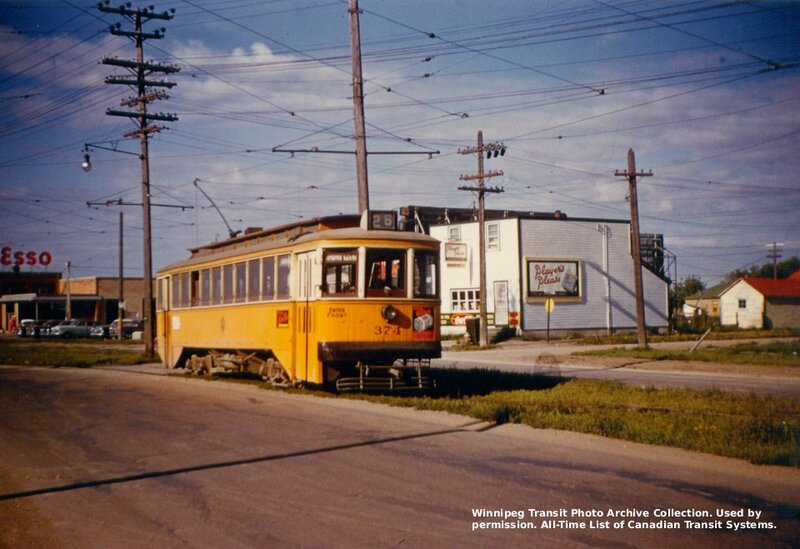 (above) Greater Winnipeg Transit Commission streetcar 374. Location: Margaret loop at the north end of Main Street route. Date: after formation of Greater Winnipeg Transit Commission 30 May 1953. Credit: Winnipeg Transit Photo Archive Collection. 17. 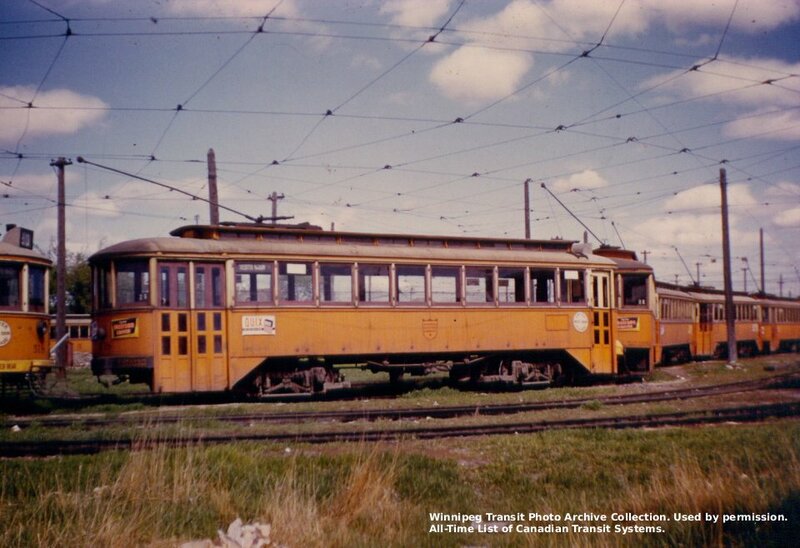 (above) Greater Winnipeg Transit Commission streetcar 738. Location: the loop at the end of the E.K. route, Henderson Highway and Roberta in East Kildonan. Date: after formation of Greater Winnipeg Transit Commission 30 May 1953. Credit: Winnipeg Transit Photo Archive Collection. 18. (above) Greater Winnipeg Transit Commission streetcar 352. Location: unidentified. double-track, suburban surroundings and late date suggest Portage Avenue or Main Street. Photographer's elevation strongly suggests this is Portage Avenue eastbound at the CPR overpass west of Omand Creek, approximately where the Empress Street overpass exists today. Date: after formation of Greater Winnipeg Transit Commission 30 May 1953. Credit: Winnipeg Transit Photo Archive Collection. 19. 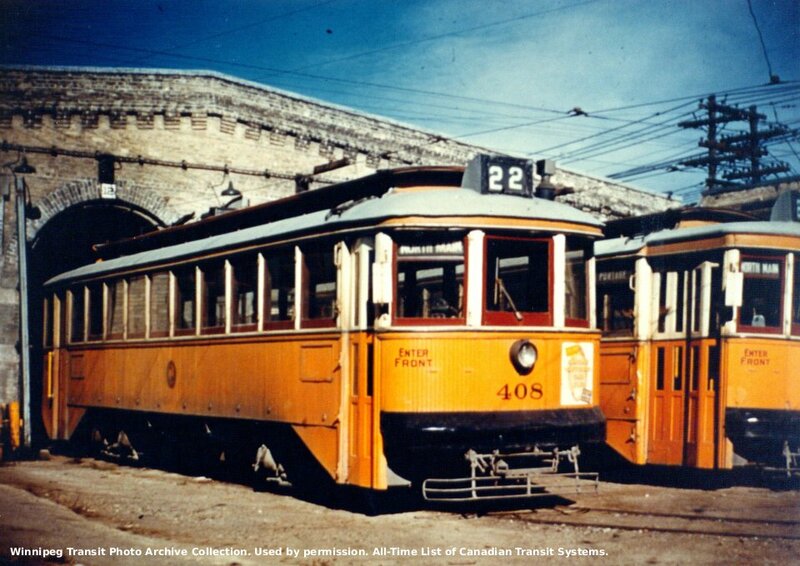 (above) Greater Winnipeg Transit Commission streetcar 424. Location: Northbound on Main Street approaching Margaret loop. Gelhorn's car dealership (with the ESSO sign) is visible in the background. Date: after formation of Greater Winnipeg Transit Commission 30 May 1953. Credit: Winnipeg Transit Photo Archive Collection. 20. 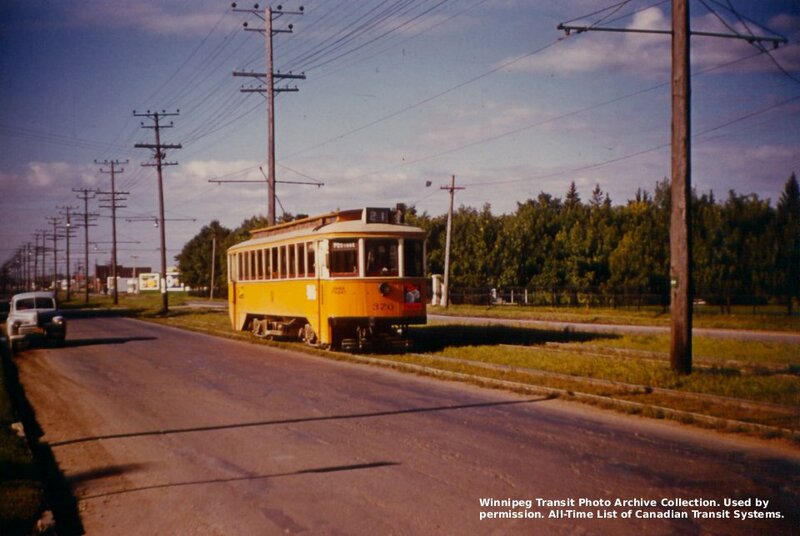 (above) Greater Winnipeg Transit Commission streetcar 374. Location: Northbound on Main Street approaching Margaret loop. Gelhorn's car dealership (with the ESSO sign) is visible in the background. Date: after Greater Winnipeg Transit Commission takeover 30 May 1953. Credit: Winnipeg Transit Photo Archive Collection. 21. 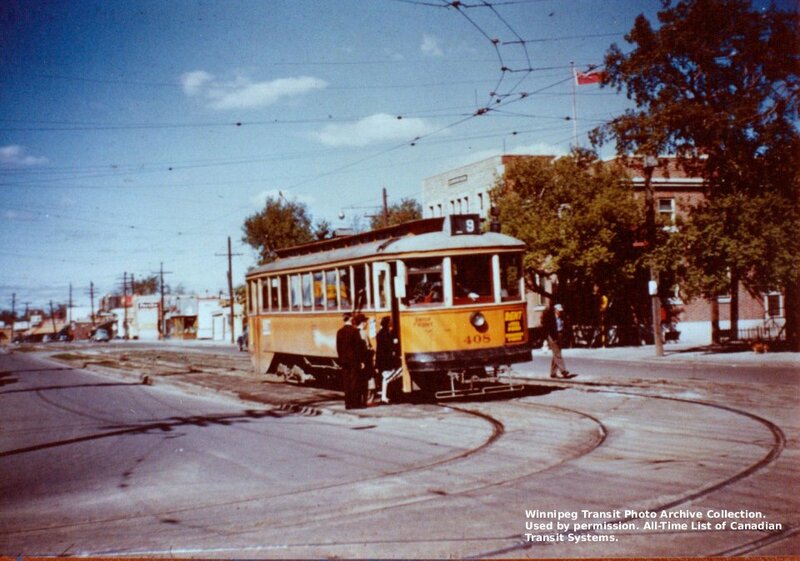 (above) Greater Winnipeg Transit Commission streetcar 738. Location: turning loop on Henderson Highway at Roberta in East Kildonan. Date: between formation of Greater Winnipeg Transit Commission 30 May 1953 and end of East Kildonan streetcar line 27 November 1953. Credit: Winnipeg Transit Photo Archive Collection. 22. 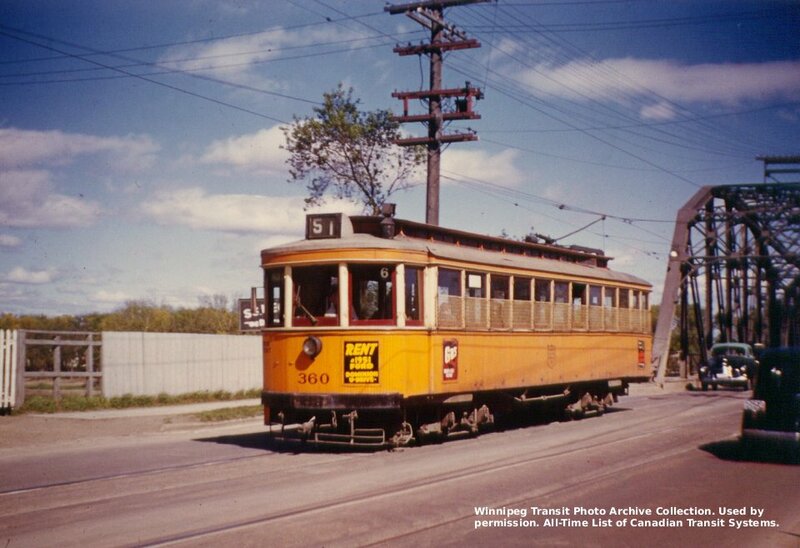 (above) Greater Winnipeg Transit Commission streetcar 356. Location: unidentified. turning loop. "Portage" route name. Tall building is the screen of a drive-in theatre. Date: after formation of Greater Winnipeg Transit Commission 30 May 1953. Credit: Winnipeg Transit Photo Archive Collection. 23. 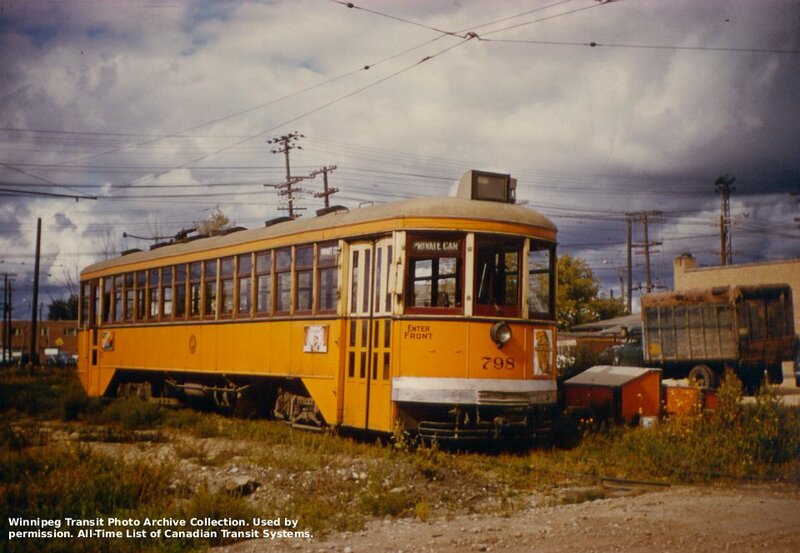 (above) Greater Winnipeg Transit Commission streetcar 798, awaiting decoration for next day's last trip ceremony. Location: Polo Park Loop in Winnipeg. 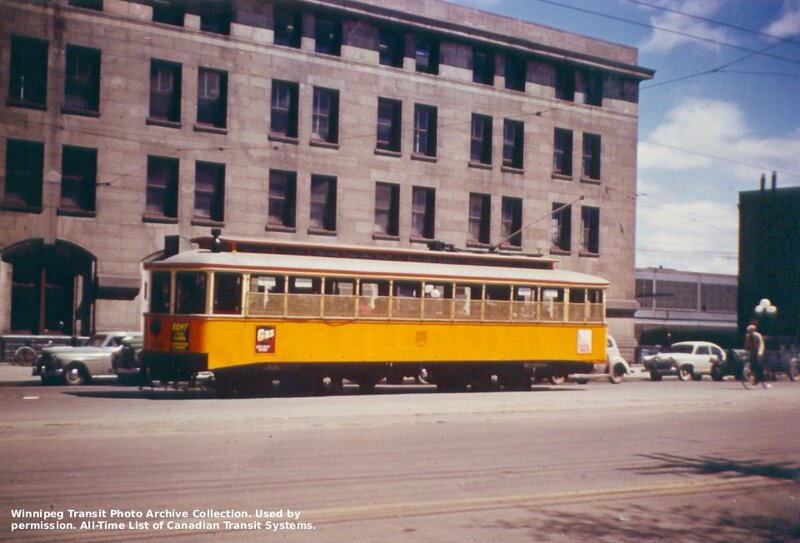 Date: 19 September 1955. Credit: Winnipeg Transit Photo Archive Collection. David A. Wyatt, Text Copyright ©2007-2012. Photograph copyrights held by the photographers.